In preparation of our CCNA exam, we want to make sure we cover the various concepts that we could see on our Cisco CCNA exam. So to assist you, below we will discuss TCPIP Addresses. In a TCP/IP environment, each node must have a unique 32-bit logical IP address. Each IP datagram includes the source and destination IP addresses in the header. All the endpoints within a network share a network number. There are five classes of IP: Classes A through E. Classes A, B, and C are the most common. 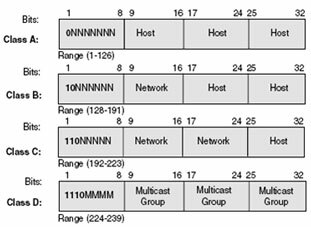 Class A has 8 network bits and 24 host bits. (So there are few Class A networks, but each has many hosts.) Class C addresses allow for many more networks, each with fewer hosts. This scheme was based on the assumption that there would be more small networks than large networks in the world. The example in the figure shows networks A and B connected by a router. Network B has a Class A address (10.0.0.0). 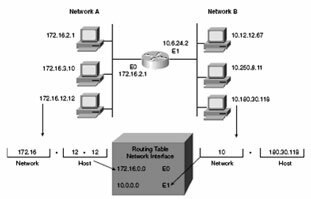 The routing table contains entries for network addresses (not hosts within that network). In the example,172.16.0.0 and 10.0.0.0 refer to the wires at each end of the router. Network 10.0.0.0 is a special case of Class A networks. It is typically used in private networks. In a TCP/IP environment, each end station has a 32-bit logical IP address that has a network and host portion. Five address classes are suited to different types of users.